Can KaiOS accelerate the transition from 2G / 3G to 4G? The GSMA Mobile Economy 2018 report forecasts that 2G will still be around in 2025 and the dominant technology will be 3G in Africa. GSMA Intelligence Global Mobile Trends highlighted similar numbers but North Africa was missing in that report. 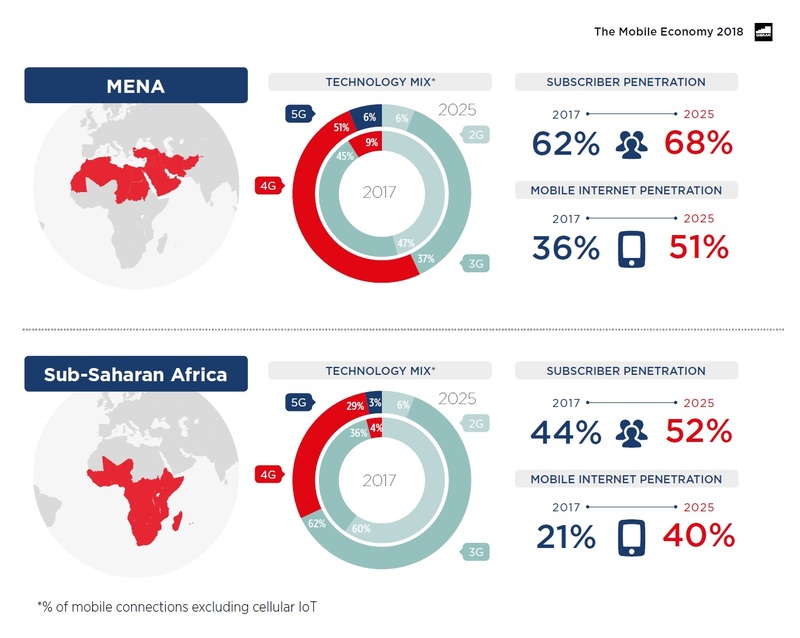 As you can see in the picture below, 3G devices will make up 62% of the total number of devices in Sub-Saharan Africa and 37% in MENA. Similar information was provided by Navindran Naidoo, Executive, Network Planning & Design, MTN Group in TIP Summit 2017 and Babak Fouladi, Technology and Information System (Group CTIO) , MTN Group in TIP Summit 2018. In fact Babak had a slide that showed 3G devices would make up 61% of total devices in 2025 in Africa. Rob Shuter, Group President and CEO, MTN Group said at AfricaCom 2018 that Africa lags 7 years behind the Western countries in mobile technologies. Though this may not be universally true, its nevertheless a fact in many areas of the Continent as can be seen from the stats. In my blog post "2G / 3G Switch Off: A Tale of Two Worlds", I said operators in many developing countries that maybe forced to switch off a technology would rather switch 3G off as they have a big base of 2G users and 3G devices can always fall back on 2G. This last point is important for many people across different parts of the world. In many developing countries electricity is at a premium. Many villages don't have electricity and people have to take a trip to a market or another village to get their phones charged. This is an expensive process. (Interesting article on this here and here). In developed countries, many schools do not allow smartphones. In many cases, the kids have a smartphone switched off in their bag or left at home. For parents to keep in touch, these kids usually have a feature phone too. They both use a new mobile operating system called KaiOS. So what is KaiOS? KaiOS originates from the Firefox OS open-source project which started in 2011 and has continued independently from Mozilla since 2016. 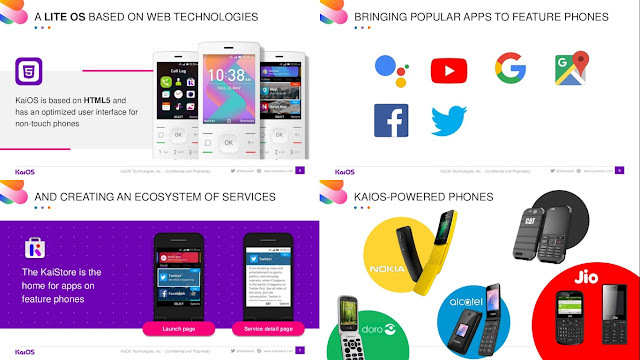 Today, KaiOS is a web-based operating system that enables a new category of lite phones and other IoT devices that require limited memory, while still offering a rich user experience through leading apps and services. KaiOS is a US-based company with additional offices in France, Germany, Taiwan, India, Brazil, Hong Kong, and mainland China. You can find a list of KaiOS powered devices here. In fact you can see the specifications of all the initial devices using KaiOS here. Africa, The Next Big Feature Phone Opportunity? I like the term 'smart feature phone' to distinguish between the smartphones and old dumb feature phones. Finally, it should be mentioned that some phone manufacturers are using older version of Android to create a feature phone. One such phone is "Reinvent iMi" that is being billed as 'Slimmest Smart 3G Feature Phone' in India. It uses Android 4.1. See details here. Would love to find out more about its battery life in practice. My only small concern is about security of old Android OS. As Android is extensively used, new vulnerabilities keep getting discovered all the time. Google patches them in newer versions of the software or sometimes releases a separate patch. All updates to the Android OS stops after 3 years. This means that older versions of Android can be hacked quite easily. See here for example. Anyway, feature phones or 'smart feature phones' are here to stay. Better on 4G than on 2G.